Extend the reach of your ATX12V power supply CPU power connector by 8in. The ATXP4EXT 4 Pin P4 CPU Power Extension Cable Cable extends the reach of your ATX12V power supply CPU power connector by 8in, making it easier to make the necessary power connection without having to "stretch" the CPU power connector from the power supply. 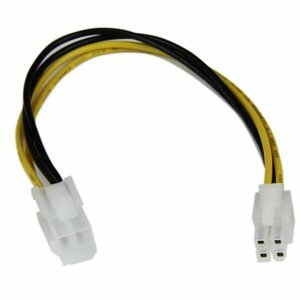 The ATXP4EXT 4 Pin P4 CPU Power Extension Cable Cable extends the reach of your ATX12V power supply CPU power connector by 8in, making it easier to make the necessary power connection without having to "stretch" the CPU power connector from the power supply.